BP and Masdar have announced a joint goal of making the World Future Energy Summit (WFES) 2016, part of Abu Dhabi Sustainability Week, the Middle East’s largest-ever event to use carbon offsetting to mitigate its carbon emissions. 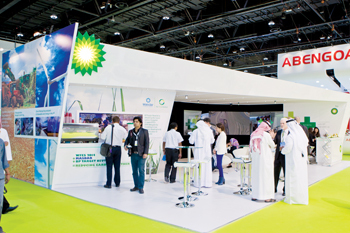 BP Target Neutral, BP’s nonprofit carbon reduction and offsetting programme, is helping WFES reduce its carbon footprint, replace carbon-intensive initiatives with carbon efficient solutions, and neutralise the residual carbon footprint by investing in climate-friendly projects. Globally, the carbon offset market is projected to cumulatively nearly double in value and grow 1.5 times in volume by 2020, according to industry experts. A report by Ecosystem Marketplace suggests that, over the next five years, the global carbon offset market could grow cumulatively from 498 million tonnes worth $2.2 billion during 2010-2014, to 712 tonnes worth $4.1 billion over 2015-2020. Demonstrating the strong demand for action on carbon, BP recently joined six major oil and gas companies in calling for global leaders to establish a global carbon tax. “BP is committed to supporting Abu Dhabi and its vision for long term sustainable development. We are delighted to partner again with Masdar. This is the third year BP Target Neutral is the Official Carbon Offset Partner for WFES; helping make the event lower carbon and investing in global sustainability projects,” says AbdulKarim Al Mazmi, president and general manager for BP UAE. “It is another example of our deep commitment to working in partnership with the government and communities in Abu Dhabi to help meet energy demand more sustainably,” Al Mazmi adds. WFES 2016 is hosting more than 30,000 attendees from 170 countries and 650 exhibiting companies from more than 40 countries. BP Target Neutral will calculate the emissions resulting from all delegate travel to Abu Dhabi. For WFES 2015, BP Target Neutral offset 5,473 tonnes of greenhouse gas emissions, equivalent to 428,209 average days of driving a family saloon car, or 478 round-trip flights from the UK to Australia. A study from Imperial College London and the International Carbon Reduction and Offset Alliance shows that for every tonne of carbon offset, up to $664 is delivered to local communities in further co-benefits, such as education, employment, and biodiversity protection. BP Target Neutral’s current portfolio of carbon mitigation projects includes deforestation mitigation in Zambia, micro-hydropower and biomass in China, fuel switching in Brazil, treadle pumps in India, and wind power in Turkey. BP Target Neutral has offset major international events including the London 2012 Olympic and Paralympic Games, Glasgow 2014 Commonwealth Games, and 2014 FIFA World Cup in Brazil.